Over the past week much rejoicing, ale-drinking, and celebration were had, for it was one of the most sacred and beloved times of the year for the people who call this great northern land their home. It was the Saint Patrick’s day festival. 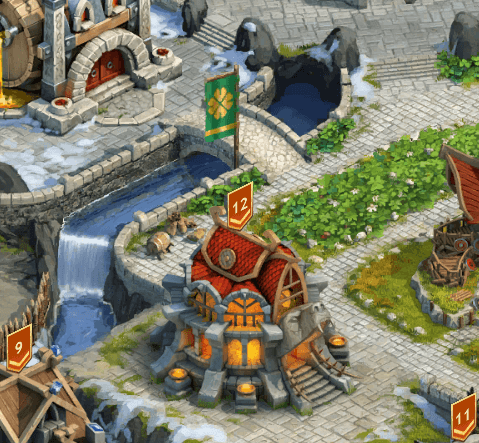 In towns all across the realm, you could see citizens decorating their homes, taking part in the celebrations and all around, just having a good time. Spirits were high in more ways than one. 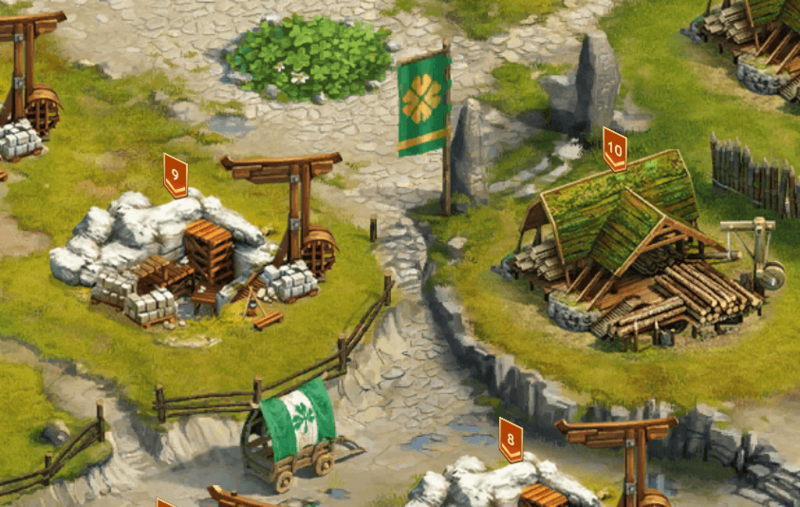 Flags were hoisted, and there were clovers aplenty as clan Chieftains allowed their people the rare opportunity to relax and take a break from the ever-present hardships they face as a people in these lands. Hostilities were greatly reduced, and even many enemies shared a pint, or two, celebrating the occasion. For a moment, all was good. This would quickly change, as people realized not all was as it should be. A cruel and sinister joke was about to be unleashed across the land, one that was eerily similar to the previously seen "Snow Creep" that we witnessed over the winter holidays. This small creature rose from the depths and began unleashing his cruel humor on anyone he could find. Jokes were in abundance, but wicked in nature were they. 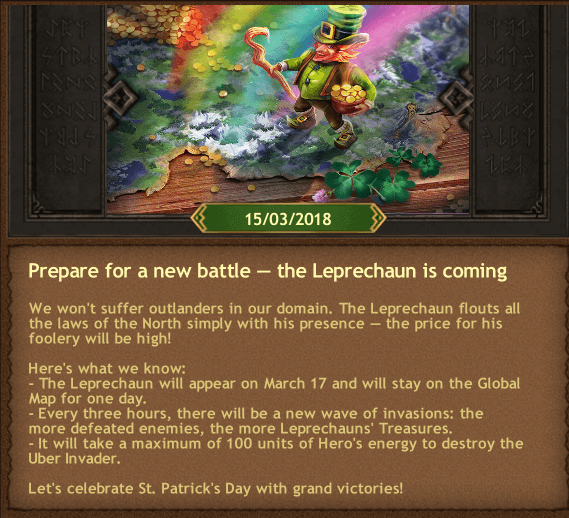 Every three hours, the Leprechaun would rise again, and every time our warriors had to ride out and smite them, wherever they could find them. 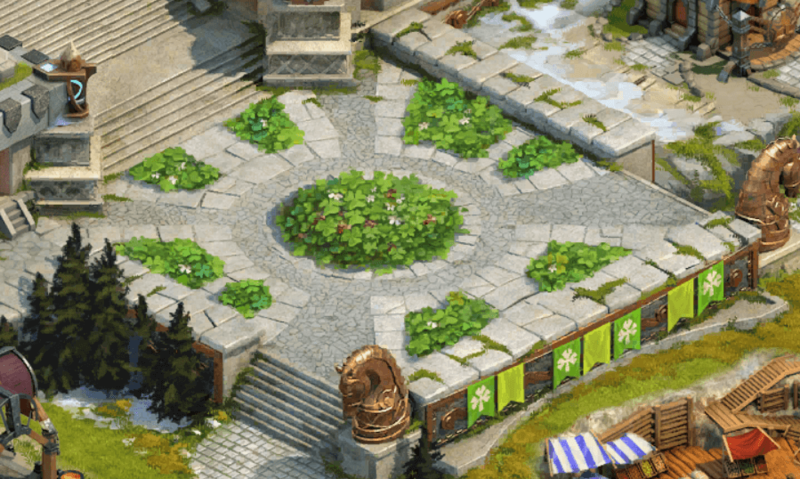 Completely random, this made their task much more frustrating, as they were forced to explore all parts of the map to rid the lands of this pest. 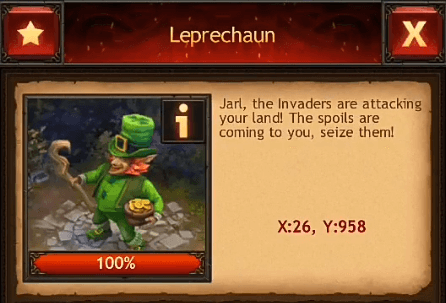 The gold they possessed, however, was a welcome sight and those brave Jarls who were lucky enough to find these Leprechauns enjoyed the spoils of crushing these tiny nuisances, reaping a much-deserved reward for their efforts. 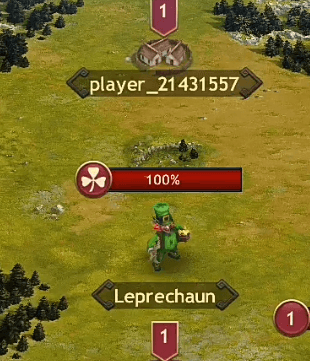 This may have put a slight damper on the festivities of the day, but the Leprechauns turned out to be much more of a joke than a true threat. They were easily dispatched in one swift stroke and were simply more annoying than anything else. As this threat was quelled, Jarls returned to their homes, chugged a large pint of green ale and resumed their celebrations. Waking in the morning in a hazy state, many were left wondering if this little green man was ever truly there, or simply a figure of their imagination and the result of one too many green beverages?